A new report from the Institute for Local Self-Reliance (ILSR) argues that home composting is vital to local waste reduction strategies. The report, Yes! In My Backyard: A Home Composting Guide for Local Government, details how home composting is among the best opportunities to reduce food waste, especially in the near term and in areas lacking curbside collection or facilities to compost. 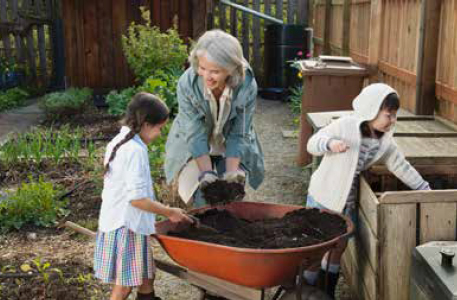 The report calls for local governments to incentivize citizens to home compost by providing training, guidance, equipment and exposure to best practices. The report finds that for every 10,000 households composting at home, between 1,400 and 5,000 tons per year could be diverted from curbside collection, with potential savings in avoided disposal costs alone ranging from $72,000 to $250,000. The report calls for local governments to think of curbside collection of yard trimmings or food scraps as a complement to a home composting program, not a replacement. Home composting programs remain a cheap and effective way to reduce municipal garbage and engage more people directly with the composting process. Local governments can avoid the labor and costs of collecting and handling material, leading to considerable savings, the report says. Co-author Colton Fagundes said fun and creative outreach and marketing will draw people in to home composting. Jerguson agrees. “We found that appealing to a person’s sense of humor, through our ‘Get Dirty’ campaign, was the most effective way to get someone to pay attention to an important topic like food waste,” he said. * Offer bins: Provide composting bins to residents – purchase in bulk through a contract with manufacturers and sell the bins at the wholesale prices; subsidize the price of bins; or provide vouchers or rebates to give residents discounts on bins sold at local retailers. * Educate and train: Offer education and training to enable home composters to succeed, troubleshoot on their own and produce high-quality compost. * Measure, evaluate and improve: Calculate your program’s costs and savings. Over time, home composting programs can be expected to save local governments more money in hauling and tipping fees than they cost to implement. * Outreach and market: Develop strong outreach efforts and innovative marketing campaigns to increase program participation. Invest in a strong marketing push when launching program to interest people right from the beginning. * Embrace supportive rules: Review existing laws and rules to make sure none prevent home composting. Update any archaic laws or pass new ordinances to support home composting. Focus any new ordinance or rule toward fostering successful and well operated home composting rather than creating prescriptive requirements that may unnecessarily stifle home composting. Be the first to comment on "Yes – In my backyard"